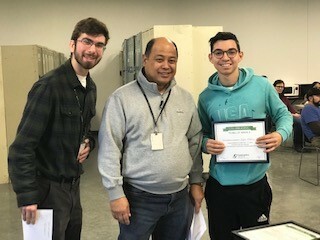 Edgar Saldivar, far right, celebrates his five year service anniversary with team leaders (left to right) Matthew Kern and Conrado Cabildo. Fernando Jaimes, center, is honored for his ten years’ service with CoreCentric. 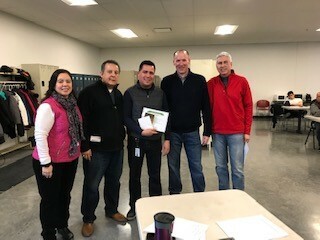 Pictured with him are (left to right) managers Melissa LaBrada-Trujillo and Lino Figueroa, as well as CEO Tom Healy and Vice President of Supply Chain Darrin Davidson. 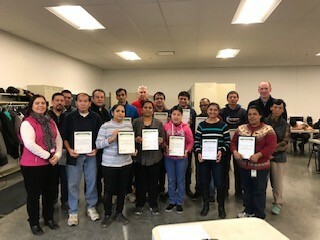 Ten CoreCentric team members, along with their managers and members of the executive leadership team, celebrate perfect job attendance in 2018.